Click Image To View Complete Large Oak Wood Water Bucket Information And Larger Image. 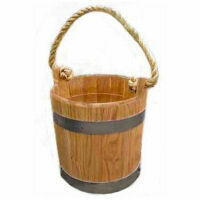 Oak Wood Water Bucket, this Oak Bucket is made of Red Oak with metal hoops and made to hold water. Fashion from the colonial era water buckets, this bucket is made to hold water and is water tight. Any buckt that is to be used to hold water should hold water most of it's life and should NEVER be allowed to dry out. Special fasteners between the staves allow this bucket to expand and contract, without losing its sturdiness. We ship orders as soon as the bucket is made, however, our buckets are hand made, please allow 7 - 14 days for delivery. If you need faster delivery, please contact us we will try to accommodate your request. Dimensions: 1/2" thick staves, 11 3/4" OD at top, 9 3/4" OD at bottom, 11 1/2" short staves, 13 1/2" long staves.